All workshops held at Ozaukee Family Services. We are located in The Family Enrichment Center at 885 Badger Circle in Grafton. An open and interactive group for parents and their children age 0-4, using books and activity stations centered around themes. Come and play with your child while interacting with other parents in our safe and fun playroom! Enjoy different toys, gain ideas to try at home, make new friends or bring friends to share in the fun! Space is limited. Please call to reserve a spot! Facilitated by Ozaukee Family Services’ Parents as Teachers staff. Tuesday, March 26, 10:00 – 11:00 am – Let’s Get Messy! Wednesday, May 1, 10:00 – 11:00 am – May Day! May Day! 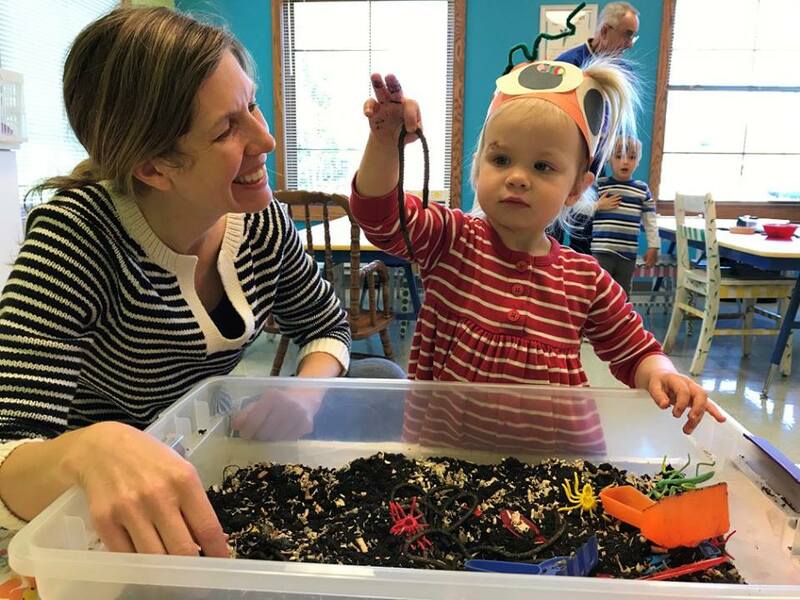 Learn ways to stimulate your 2 – 4 year old’s learning and creativity through these play-based parent and child workshops. These workshops fill quickly! Facilitated by Ozaukee Family Services’ Parents as Teachers staff. As a parent or caregiver, how do we support someone who is struggling with anxiety? What’s the difference between ‘normal’ situational anxiety and something more? Learn to recognize symptoms and how anxiety can affect a child’s day to day life. Dr. Dave and Allie will discuss types of anxiety and strategies for both parent and child to ease challenging situations. Facilitated by Dr. David Eichenhofer, PhD., Eichenhofer Psychological Services and OFS counselor, Allie Eichenhofer, MSW, APSW. For parents of children who are more intense, persistent, resistant to change or generally more spirited than most. Learn ways to work with your child’s spirit and temperament, including positive parenting and discipline techniques. Techniques and teachings based on Raising Your Spirited Child by Mary Sheedy Kurcinka. Facilitated by Kathy Bergmann, Parent Educator. Does your child only eat certain foods or suddenly refuse to eat his favorite foods? Are you frustrated that mealtime is a battle with your child? Please join in a conversation about raising healthy eaters. WIC nutritionists will be sharing tangible, practical strategies to help minimize mealtime frustration and provide easy meal ideas for busy families. WIC is a supplemental nutrition program for pregnant, postpartum and breastfeeding women, infants and children under 5 years old. However, this class will address eating habits of older children as well. A great smile has 32 parts…but, what if getting the kids to brush is a battle? Are the kids doing a good enough job when they brush? Developing healthy dental habits has a lifelong impact. Learn tips and techniques from Dr Katie Hansen, DDS, Hometown Dental, to make brushing less stressful and more fun for you and your family. This 7-week course for parents is an evidence-based parenting program designed to help promote the social, emotional and academic success of kids ages 2-14. Parents learn how to prevent, reduce and treat emotional challenges in children through a positive and nurturing approach. The course introduces developmentally appropriate and consistent responses to increase children’s self-esteem, reduce conflict in the home and promote a strong and healthy family. Facilitated by OFS staff. Kathy Bergmann, Certified Educator of Infant Massage and OFS parent educator, will demonstrate how to perform basic infant massage and stroke techniques. She’ll share the benefits of infant massage for both the infant and care giver including research regarding the benefits of touch in the healthy growth and development of a child. Parents/caregivers are invited to attend with babies from birth to 10 months. Please call 262-376-7774 or email to register or for more information. Thanks to the generous support of Ozaukee Family Services Donors and United Way of Northern Ozaukee, we offer all of our classes FREE OF CHARGE! Thanks to the generosity of QuestionPro and its online survey platform, we are able to measure the outcomes of our programs and make ongoing improvements to better serve our community.